Freezing is a much better way to preserve the sweet taste and tender texture of fresh peas than pressure canning is. It also preserves more of the nutrients in this healthy vegetable than canning does. 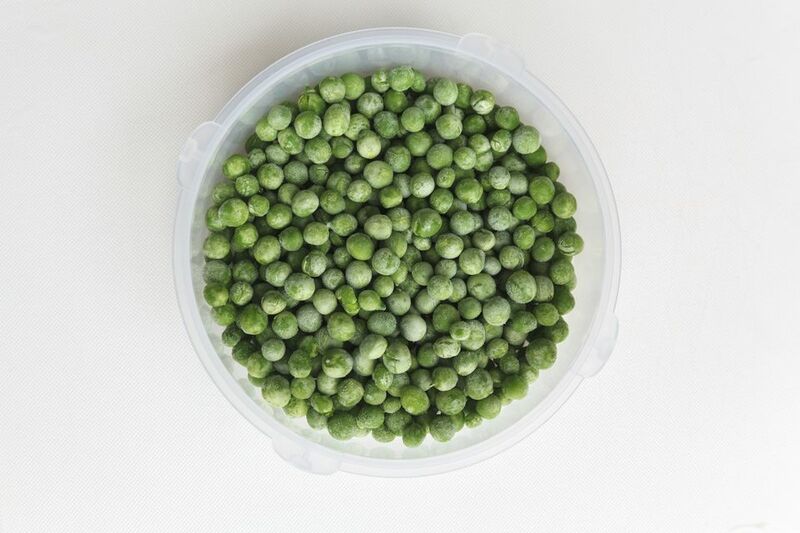 Giving the peas a quick blanching in boiling water before freezing them ensures that they will retain their bright green color and do not turn to mush when you get around to cooking with them. The single-layer initial freeze prevents the peas from clumping together. The fact that they stay loose is a big advantage when, for example, you have a quart container of frozen peas but only need to take out a cup of them for a recipe. You will need a pot of boiling water, large bowl of ice water, colander, baking sheet, and freezer bags. You will need to ensure you have space in your freezer to place the baking sheet while the peas freeze. Preparation: Set a pot of water to boil on the stove. Prepare a large bowl of ice water nearby. Shell the Peas: Snap off the stem end of the pea pod and pull it towards the tip. If the pods are stringy (sometimes called zipper peas), this step will "unzip" the pods so that it is easy to get the peas out. Otherwise, simply open the pods and remove the peas. Blanch the Shelled Peas: Once all of the peas are shelled, drop them into the pot of rapidly boiling water. Let them cook for just 1 1/2 minutes. Drain the peas quickly in a colander. Chill the Blanched Peas in Ice Water: Immediately transfer the peas to the bowl of ice water. This stops the residual heat in the peas from continuing to cook them. Leave the peas in the ice water for 2 minutes. Drain the peas well in a colander. Single-Layer Freeze: Spread the blanched peas in a single layer on a baking sheet. Make sure that it is one with raised sides so that the peas don't roll off of the sheet. Freeze for 1 hour. Store the Frozen Peas: Transfer the frozen peas to freezer bags or containers and label the bags with the date. Frozen peas will keep for eight months. They are still safe to eat after that, but their quality will decline. It is not necessary to thaw frozen peas before cooking them. To enjoy them plain, you can steam or boil them lightly. You can add them frozen to soups, casseroles, or stir-fry dishes. For salads, allow them to thaw in the refrigerator or at room temperature before adding them to greens. The quicker you can get this vegetable from harvest to freezer, the tastier the final product will be. Look for pods that are bright green and not yet starting to dry out at the stem end. The shape of the fully formed peas should be easy to feel through the pods. It's best to store them frozen in bags that have the amount you will use in a recipe. Otherwise, opening the bag to remove some will introduce air and moisture that can lead to freezer burn and the quality of the remaining peas will decline faster.